I’ve been back in Blighty for a couple of weeks. I arrived on the same day as the London riots really kicked off – and left when they had all but been forgotten. News moves so fast now with the far-reaching arm of the media, you can be in the eye of a storm and then suddenly the sky is clear and you can’t imagine it ever raining again. I was back to finish a job and say goodbye to my friends once and for all. I’m not sure if it is me or my friends or just the way it is in London, my profession, the time of year, the atmosphere, whatever, but almost every meeting I had with my friends involved alcohol. And because of that almost every meal I ate was as a result of knowing I was having a few drinks – or missing a meal altogether because it was too late to eat, or scrabbling around with packets of pub crisps. It’s the way we socialise in the UK. It didn’t cross anyone’s mind to go for a meal – maybe it’s the expense – I wish it wasn’t so but it seems to be that everyone has a pub, as the default activity, built into them and society in the UK is not helpful towards those who just want to go for a juice or a Green tea – any establishments serving non-alcoholic beverages seems to shut after working hours, so that you are almost forced to go to the pub. I always think these figures have nothing to do with me. I imagine these figures are referring to the people who drink spirits in the morning or the woman I saw on my way home from work who was sick on herself as she swigged from a bottle of wine. I don’t imagine it to be me, or my jolly friends having a few pints in the pub. But there lies the problem. If we are told not to drink more than a pint per day (women can have 3 units and men 4 units of alcohol) – and if we are all told that it is unhealthy to drink more than that, then why are we all doing it anyway? It surely can’t be down to addiction. I can understand the smoking addiction. Smokers know it is terrible for their health to smoke but they are to one extent or another addicted to a substance. Surely the group of friends who meet after work for a couple of pints are not addicted to alcohol? I think we are conditioned to do this – the after work drinks, the Christmas parties, the epic Hen and Stag dos. But I also think despite the Government attacking binge drinking and banging on about how much it costs the NHS to clean us all up, they probably make more money on taxes (in London it is around 4 quid for a pint now) of alcohol and cigarettes and in some ways we stand little chance – there is very little else we are taught to do when socialising. If I said to my work friends let’s go for a Green tea, they would think I was pregnant, and if I said I just didn’t want to drink they would think I was on a crazy detox diet, rather than just accepting it was a normal thing to do. I haven’t heard of any deaths relating to Green Tea (I Googled death by Green Tea and all that came up was how it increases life expectancy) and I am pretty certain any incident relating to drinking excessive amounts of Green Tea would be less expensive to clear up than the results of five or six after-work pints. Of course there are those who drink responsibly, but I’m just shocked to realise that I don’t know many people who do. Just because me and my friends aren’t smashing up shops and starting fights and being sick on ourselves – it does not mean we are drinking responsibly. The responsible bit is not about your actions as a result of drinking – it’s about your responsibility to yourself and your health. And I know very few people who have the one drink and then stay and drink soft drinks (it’s not much fun hanging around with drunk people). The fact is almost everyone in the pub is binge drinking the moment they take a sip from their second drink. But we all think because it’s normal, it’s OK.
Point is, I didn’t do very well at the Big Life back in the UK. I probably could have done better – had my Miso every day – but I felt rushed and crowded and out of sorts. Commuting and catching the tube and staying with different people just does not help me and routine seems to be the only way I can properly function, and I had just about got in to a good routine in Paris. It’s easier to buckle down here and get on with it and drinking the odd glass of red wine with a meal is the norm here. People don’t order bottles of wine with their meal, they have carafes of various sizes but rarely do I see anyone have more than a couple of small glasses over an entire meal. I’ve been told French colleagues rarely go out drinking after work – that’s left to the expats. So there is hope for me in Paris. We’re heading to the mountains in a couple of days to do some trail running – and maybe a bit of Yoga to balance out the violence of those rocky paths – but I think the change will help me back on track. Having time, waking up and only having to think about fresh air and where we will run. Just have to take some lentils with me and avoid the tartiflette, and hope I get to the point when I can’t remember why I would want the pub crisps. Give myself the time to change. 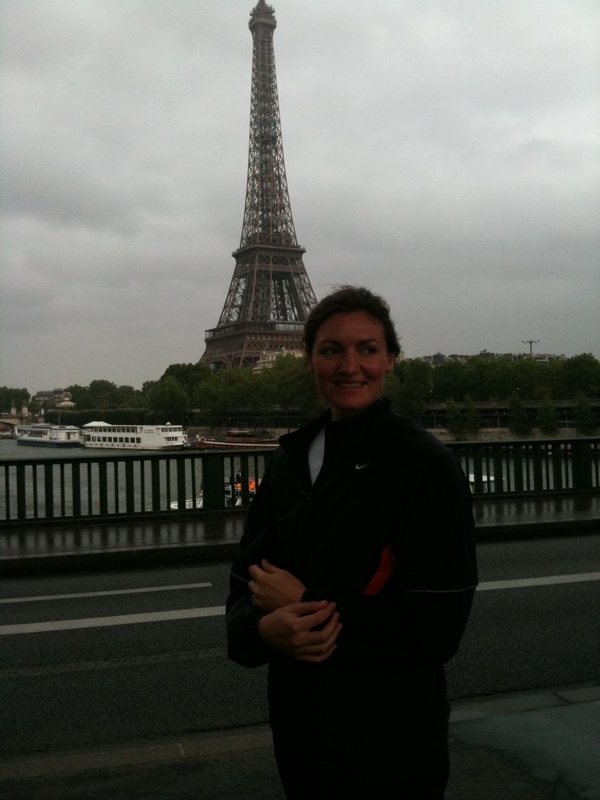 Since I moved to Paris I have started running again. I’ve always been sporty but I started running about six years ago and I take it with me wherever I go. I used to travel all over the world for my job and running was the one thing which I could do, whether in the hotel gym or out exploring a new city. So I’ve been pounding the streets of Paris. But here lies the problem. Macrobiotics is all about balance and not extremes, and running is quite a violent activity. People who follow a macrobiotic lifestyle focus more on exercise such as Yoga, Thai Chi and Pilates. I’m up for trying anything new so I will take up one of these – probably Yoga as I know a class close to me, which is held outdoors in the park. But I won’t be giving up my running – it is my own private meditation and I love the feeling of movement and exploring new places. I’m sure yoga and meditation can also take you to other places, so I’ll do both and see where I end up.